Only Alfred Hitchcock would brick up his fireplace on Christmas Eve. Maybe because he's the only one who could get away with it with finding coal in his stocking the next day! 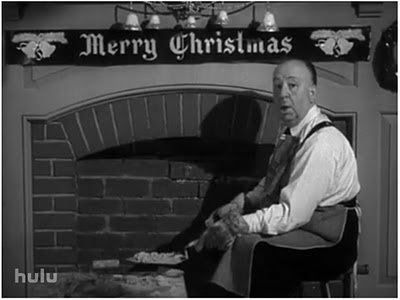 In the intro to the December 18, 1955 episode of Alfred Hitchcock Presents, Hitchcock, brick in hand, said, "Santa Claus is always bringing surprises to others. I thought it would be interesting if someone surprised him for a change. I’m rather tired of his tracking soot in here every year." Then he places the final brick in place and continues, "There. Let him Ho Ho Ho himself out of that!" to all my Hitchcock Geek friends! ...Merry Christmas! and I hope that you, your family and friends have a pleasant and safe New Year too! to check that episode out. merry christmas! i'm ashamed to say that i only just watched my first episode of alfred hitchcock presents a few days ago. this is now one of my favorite quotes about television. "crime doesn't pay. not even on television. you must have a sponsor." I'm a big fan of Hitch. Congratulations for this fantastic blog! Thanks for dropping by and have a great new year!